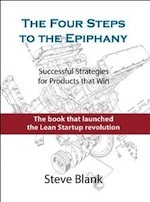 I realized that traditional ways to think about startups – have an idea, raise some money, do product development, go through an alpha test, beta test and first customer ship was the canonical model of how entrepreneurs thought about early stage ventures. This product development diagram had become part of the DNA of Silicon Valley. So much so that after I started teaching I’d ask, “Can anybody recognize this model of startups?” And when everyone raised their hands I used to joke, “Even the waiters in San Francisco could draw this model.” But in 2002 a student with a pained look on his face raised his hand and said, “Well, we’re now waiters in San Francisco because we used to be CEO’s of dot-com companies.” So I no longer make that joke. When I looked at the diagram in that ski cabin I realized there was a fundamental question I couldn’t answer: if all startups follow that model, why is it that some companies are opening bottles of champagne at their IPO and others who almost followed the same rules are selling off their furniture? What was the difference here? Were all startups the same? Were startups failing because of product failures or was there some other failure mode? Is there any way to predict success or failure? 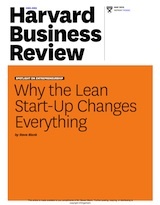 And even more importantly, was there any way to reduce risk in early stage ventures? That day, alone in the cabin I knew I had to find the answer. 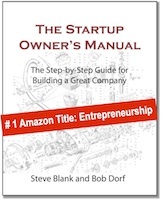 As a new startup, I came across your book and suggested that we use it as a guide in the process of new product creation. It has been very helpful in addressing the importance of testing your assumptions before investing large sums. I was glad to find your blog and look forward to reading it.